Any individual, irrespective of age and gender, who is a resident in India and satisfies the verification process laid down by the UIDAI can enrol for Aadhaar. Each individual needs to enroll only once which is free of cost. You can go to any authorised Aadhaar enrollment centre anywhere in India with your identity and address proof. 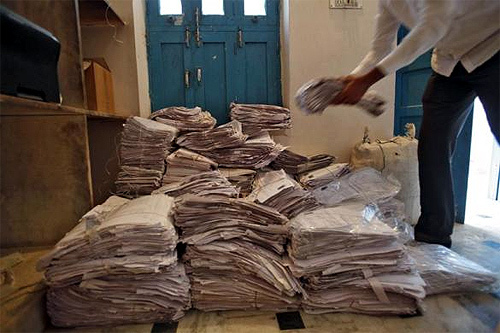 UIDAI process accepts a nationally valid list of documents. Common proofs of identity and address are election photo ID card, Ration card, passport and driving license. In case you do not have common proofs, Certificate of Identify having photo issued by Gazetted Officer/Tehsildar on letterhead is also accepted as Proof of Identity. Even if someone in a family does not have individual valid documents, the resident can still enrol if his/her name exists in family entitlement document. In this case the Head of Family in entitlement document needs to be enrolled first with valid PoI & PoA document. The head of the household can then introduce other members in the family while they are enrolling. UIDAI accepts 8 document types as Proof of Relationship. Please click here for a nationally valid list of documents. Where there are no documents available, resident may also take the help of Introducers available at the enrolment centre. The Introducers are notified by the Registrar. At the enrollment center, one has to fill personal details in the form. Your photo, finger-prints and iris scan will also be taken as a part of the enrollment. You can review the details you have provided and make corrections during enrolment itself. Based on your information provided, your details will be verified centrally. If your application is successful, an Aadhaar number will be generated and mailed to your address. The waiting time for Aadhaar may vary from 60-90 days. 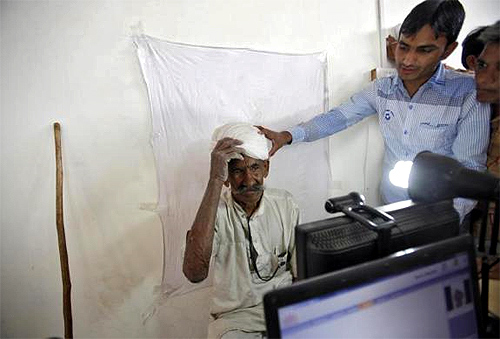 Image: A villager goes through the process of eye scanning for Unique Identification (UID) database system at an enrolment centre at Merta district in Rajasthan. Aadhaar number will help you provide access to services like banking, mobile phone connections and other government and non-government services in due course. It will be easily verifiable in an online, cost-effective way and will eliminate the large number of duplicate and fake identities in government and private databases. 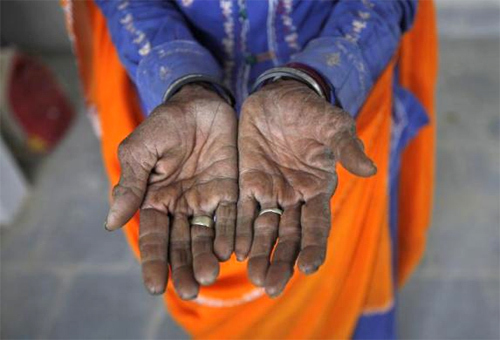 Image: Radha, 75, a vegetable vendor poses with her hands after she got her fingerprint scanned for the Unique Identification (UID) database system at an enrolment centre at Merta district in Rajasthan. 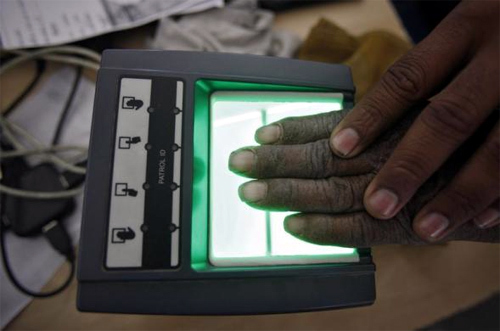 The Unique Identification Authority of India (UIDAI), is an agency of the government of India responsible for implementing the Aadhar scheme, a unique identification project. 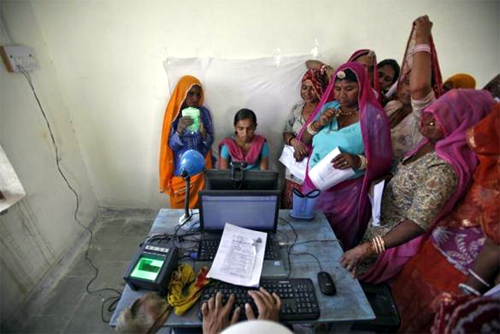 Image: Village women stand in a queue to get themselves enrolled for the Unique Identification (UID) database system at Merta district in Rajasthan. 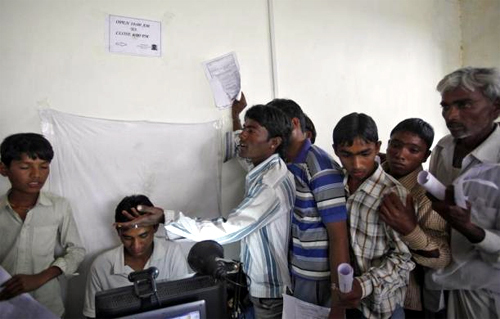 Established in February 2009, the authority aims to provide a unique id number to all India. 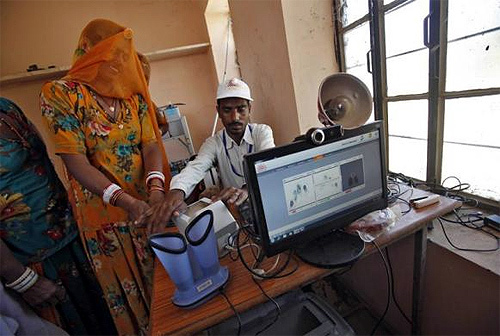 The UIDAI authority will maintain a database of residents containing biometric and other data. 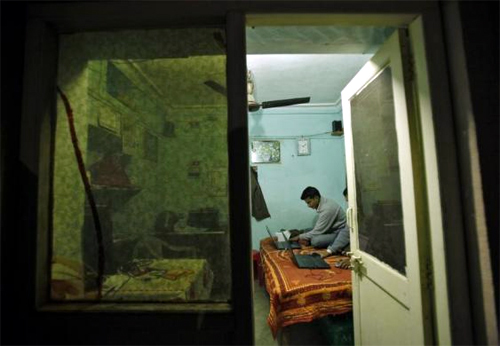 Image: Unique Identification (UID) database system operators work inside a temporary space at Merta district in Rajasthan. Aadhaar will over time be recognised and accepted across the country and across all service providers. 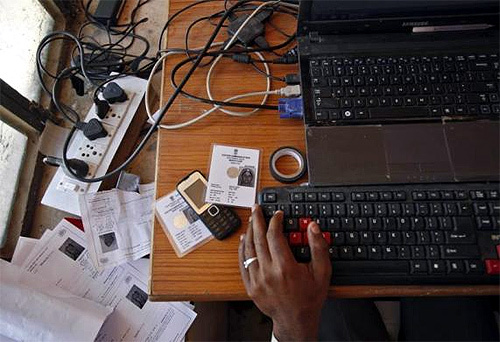 Image: An operator arranges the Unique Identification (UID) documents submitted by people for their enrolment in Rajasthan. Aadhaar number will consequently form the basic, universal identity infrastructure over which Registrars and Agencies across the country can build their identity-based applications. 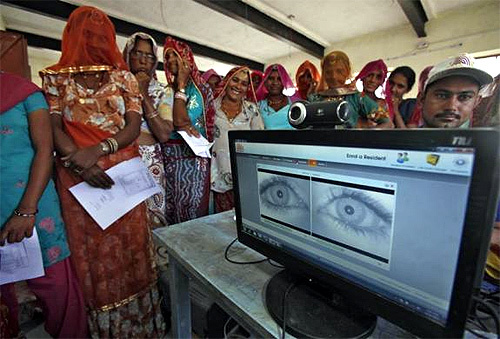 Image: Villagers stand in a queue to get themselves enrolled for the Unique Identification (UID) database system at Merta district in Rajasthan. Such Registrars may include state governments, state Public Sector Units (PSUs), banks, telecom companies, etc. These Registrars may in turn partner with enrolling agencies to enrol residents into Aadhaar. Aadhaar will ensure increased trust between public and private agencies and residents. 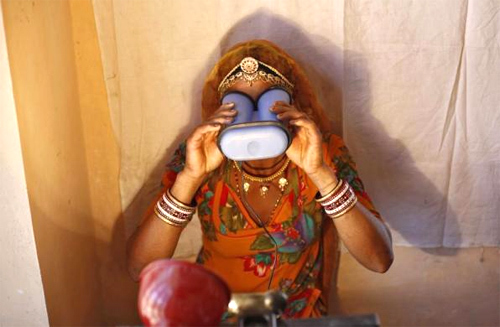 Image: A villager gets ready to be photographed for the Unique Identification (UID) database system at an enrolment centre at Merta district in Rajasthan. Once residents enrol for Aadhaar, service providers will no longer face the problem of performing repeated Know Your Customer (KYC) checks before providing services. They would no longer have to deny services to residents without identification documents. 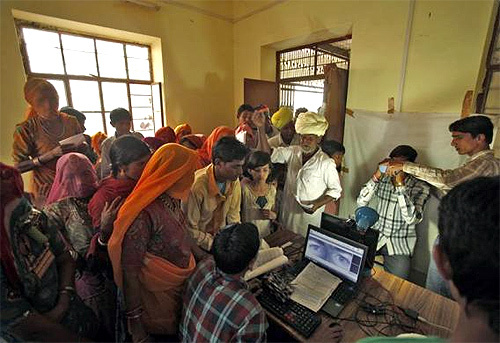 Image: Villagers crowd inside an enrolment centre for the Unique Identification (UID) database system at Merta district in Rajasthan. By providing a clear proof of identity, Aadhaar aims to empower the poor and underprivileged residents in accessing services such as the formal banking system and give them the opportunity to easily avail various other services provided by the government and the private sector. 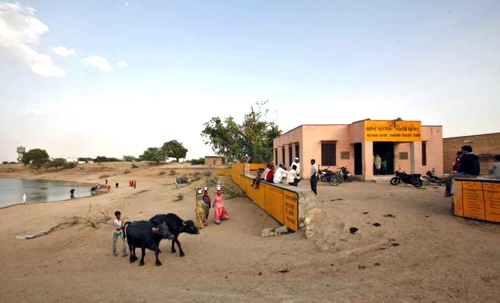 Image: A general view of an enrolment centre for the Unique Identification (UID) database system is pictured at Merta district in Rajasthan. 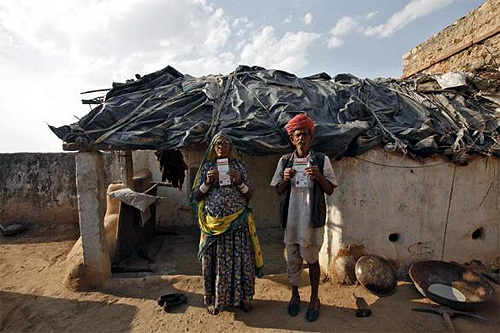 Ghewar Ram (R), 55, and his wife Champa Devi, 54, display their Unique Identification (UID) cards outside their hut at Merta district in Rajasthan. An operator works on his table while enrolling villagers for the Unique Identification (UID) database system at an enrolment centre at Merta district in Rajasthan. 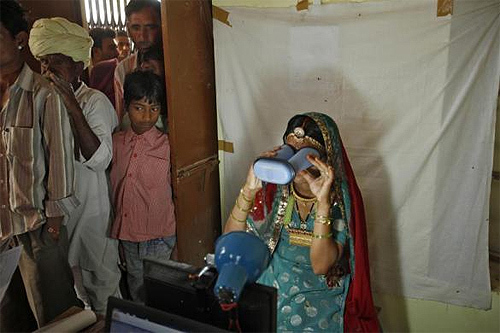 A villager goes through the process of a fingerprint scanner to register for the Unique Identification (UID) database system at an enrolment centre at Merta district in Rajasthan. A villager prepares to be photographed for the Unique Identification (UID) database system at an enrolment centre at Merta district in Rajasthan. E-ticketing from mobile phones, SMS alerts soon!